A huge thank you to Smile Brilliant for sponsoring this post. All thoughts and opinions are mine. It’s 100% true what they say, you become your mom the older you get, especially with children. JUST WAIT FOR IT. 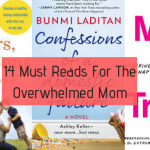 If you’re anything like me, then one day you’ll realize it and say “Oh Sh*t, I am my mom.” . My mom has always instilled healthy habits and routines in our household. 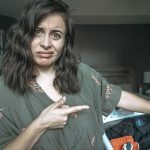 Now, routines have also helped me, as a mom, and Liam, a curious toddler, become more independent. 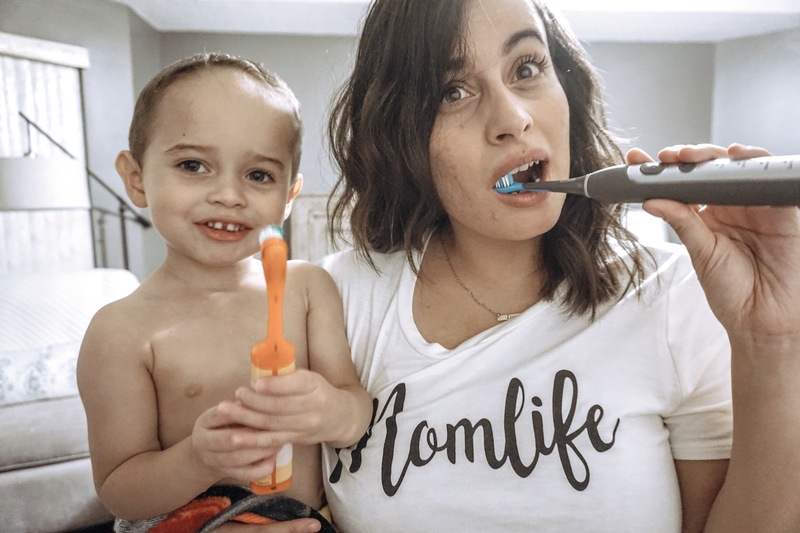 Now that he is 2 1/2 and persistent about doing everything himself, I’ve made it priority to show him how important it is to brush our teeth every day. I’ll be very honest with you, I haven’t been consistent, at brushing his teeth on a daily basis. However, for the past two months, we built our own teeth brushing routine together. Since I am still a stay at home mom and have a pretty hectic schedule, Liam and I tend to do things at the same time. If he takes a bath, I take a shower. If he drinks/eats, I drink/eat. If he brushes his teeth, I brush my teeth. Taking care of his daily needs, also remind me of my own, which I, sometimes, tend to forget. Point is, do not forget to do things for yourself too, including brushing your teeth. Brushing your teeth doesn’t need to take up a lot of your own time, so don’t over complicate it. But there are many ways that you can make it more fun and enjoyable for you and your toddler. 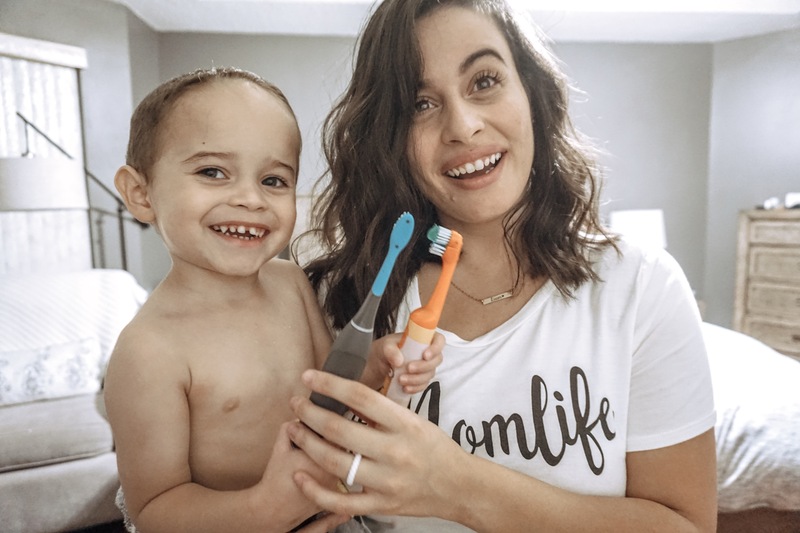 Let your little one pick out his or her own toothbrush. I took Liam to Target and let him decide which he wanted. He ended up choosing this minion electric toothbrush. He immediately was attracted to the colors and the fact that it was a familiar character to him. We dressed up as minions last year for Halloween. It was super cute to see him very excited about his toothbrush because it also was very similar to mine. I am currently using this Smile Brilliant Electric Toothbrush. 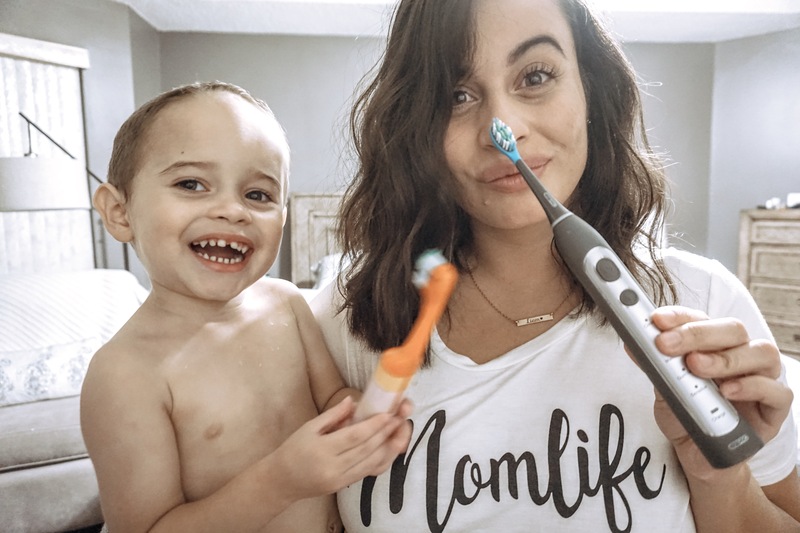 Don’t just brush their teeth, do it with them. Children learn by example, so it’s important to show them rather than saying. While we brush our teeth, we laugh, smile, and even make it a competition. Be consistent. This is something that I, myself, have to work on. It’s definitely easier said than done. No matter what we do or how cranky we are, we brush our teeth right after lunch/before our nap and after bath-time. The consistency has also helped him remember what to do, he is still not 100% independent at doing it but he will vocalize that it is time to brush our teeth. Smile brilliant reached out to me to review their new CariPro Electric Toothbrush. I have been using it for about a month now and I absolutely love it. I am VERY IMPRESSED with the quality of this electric toothbrush. Dare I say, it’s better than my Philips Sonicare Electric Toothbrush, that I have been religiously using for over a year. What I love about the Smile Brilliant CariPro Electric toothbrush is the different brushing options that you can choose from that range from whitening to polishing. The prices also very affordable considering it’s high quality. To give you an idea, Smile Brilliant is $119 for it’s Electric toothbrush, charging dock, and 2 electric toothbrush heads. In my opinion, It’s comparable to the Philips Sonicare DiamondClean Electric Toothbrush, which costs $209.99 to $251.99. BIG DIFFERENCE! What I don’t love about this specific toothbrush, but is very common among electric toothbrushes, is how loud it actually sounds. Also, don’t accidentally open your mouth while brushing or you’ll splash it on your mirrors. To me, these are minor details that I really don’t care about. What I care about is how well it brushes. And it does not disappoint. I highly recommend this electric toothbrush if you were looking for something that won’t break your bank account yet won’t compromise the quality you’re looking for to keep your teeth healthy. AND THE BEST PART YET! YOU CAN WIN $119 SMILE BRILLIANT CREDIT, BASICALLY A FREE INDIVIDUAL TOOTHBRUSH PACKAGE! Good luck to all of you who enter. I’m really excited to be able to share with you something that I truly do love. As always, please drop a comment below and let me know how you build your child’s tooth brushing habits at home. It’s important that we are consistent and brushing our teeth daily, especially knowing the impact our teeth can have on our overall health.